Students on free school meals will get an average of £370 a year less under plans to replace axed study grants in England, a think tank has said. On Tuesday, the government announced £180m for bursaries for low-income 16 to 19-year-olds after cutting the £560m Education Maintenance Allowance scheme. The Institute for Fiscal Studies said uncertainty over bursaries might put off students from staying in education. The government argues the old scheme was poorly targeted and wasteful. Under the EMA scheme, 650,000 16 to 19-year-olds from low-income families received direct payments of between £10 and £30 per week. But the new measures instead allocate £1,200 per year for 12,000 teenagers with the greatest needs, such as pupils in care, care leavers and the severely disabled. On top of this, there will be £165m for colleges and schools to make discretionary payments to support low-income students with costs such as transport, food and books. The IFS argued said it was "clear that many existing EMA recipients will get less money than at the moment". When he announced the scheme, Education Secretary Michael Gove said the bursaries fund was enough to allow £800 a year for every child eligible for free school meals who choose to stay on. But the IFS said that under the old scheme, such students received the full EMA payment of £30 a week - which totals £1,170 a year. "It must be the case that most such students would be worse off under the bursary scheme than they would have been under the EMA - on average, to the tune of £370 a year," the IFS said. "Furthermore, allocating the bursary fund in this way implies that other EMA recipients not currently eligible for free school meals would in future receive nothing," the think tank added. A government spokesman said: "The fact is that we are guaranteeing payments to the poorest and most vulnerable students to give them real certainty over their futures. "The £800 figure is just an example of how much money is actually in the pot - but clearly it will be down to colleges to decide where to target the cash." The Department for Education says very few students receive the full £1,170 per year. The average amount received per year by students on £30 a week is £760, it says, because of the usual length of college terms and because students only receive the payment for the weeks they attend fully. The IFS also warned that, as most of the funding will be allocated by the colleges, students will not know when they apply how much support they will receive and "this could have an impact on their decision to stay on in the first place". The government has launched an eight-week consultation on how the discretionary fund will be distributed between colleges. The IFS also warned that giving colleges freedom to decide how best to allocate the funds could enable them to use the money to attract certain types of students, such as high-achieving, low-income students - "perhaps the type of students who would have stayed in full-time education anyway". The government argued that the old policy had a high "deadweight cost", saying that research suggested 90% of students receiving EMAs would stay on without the payment. On Tuesday, Mr Gove said that MPs had to consider "whether it is socially just to be paying 45% of students a cash incentive to stay in learning when we could be concentrating our resources on removing barriers to learning faced by the poorest". James Mills, head of the Save EMA campaign, said the IFS assessment was "yet further evidence that the last thing we should be doing is scrapping EMA". "If the scheme the government want to replace it with is clearly more inadequate than EMA, why are we even considering wasting tax payers' money changing it? ", he said. The EMA allowances were introduced by Labour in an attempt to tackle the long-standing problem of a high teenage drop-out rate from education, particularly among poorer students. 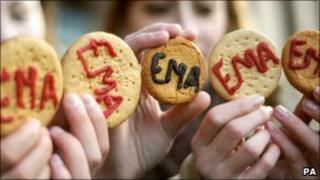 EMA schemes in Scotland and Wales are continuing - and the allowances in Northern Ireland are under review.